Keith was born in Farnborough, Kent, in 1935. He recalls with great excitement witnessing the Battle of Britain as a young boy, loving the Spitfire planes flying over his home, being only a few minutes from Biggin Hill (captured in some of his watercolour paintings). He was evacuated to his Grandparents in Cwmgorse, near Swansea, in Wales, learning some Welsh. On returning to Farnborough and school, he joined the school boxing team. He went on to box at welterweight in the Amateur Boxing club at Beckenham. This was the start of the building of his character and he has some lovely little stories from this time (“read the book”). He has always enjoyed his sports big time: football, rugby, cricket and sailing and of course pubs! They go hand in hand, don’t they?! After school, Keith moved on to study at Beckenham School of Art, but he wasn’t keen with his time there and left, taking himself to Grove Park, where he signed up for the Army. Again, there are some great stories to be heard about this time, but he isn’t quite ready for them to be repeated in print yet (“read the book!”). One bit of information though, is that he was in the Army Olympic Cross-Country Ski Team, but due to one little accident, he didn’t quite make the 1960 Olympics. After his Army service, Keith returned to advertising and went on to work at London’s leading art studio, Carlton Artists, in Portman Square. He moved on to become Art Director for a top American advertising agency. He won many awards creating corporate identities and campaigns for several international clients. During this time, he became quite a high flyer, spending his money and the next years designing and building racing cars (and women! ), which he then raced in the British (actually won the British Championship), European and World Championships of Sports Cars (the cars I mean). He carried on his advertising career and finally managed his own creative consultancy in Chelsea. He has always enjoyed jazz since his teens, playing drums with many great musicians, often in his own band. He helped run the Steering Wheel Club in Curzon Street, London. Oh! The stories we have of this time. Many famous musicians paid visits, to unwind after their London gigs. One such time, some of the Woody Herman band arrived and one by one, took out their musical instruments and played a storm. The hotel opposite phoned at 3am to ask what was going on, you’re disturbing the guests! So Keith said to send them over. Keith and I met in 1985. He was such great fun, making me laugh so much. Having just been widowed, I needed this. It was just prior to the closing of the Steering Wheel Club and I so enjoyed London, never having experiencing such night-life before, only daytime. Keith began playing drums again and I became his roadie. It was in 1990 that we started our own jazz club at Badgers Mount, with great bands, such as the 15pce Chrissie Lee Big Band, all girls (what connotations could be used on the mike, i.e. the Chrissie Lee big girls’ band!). 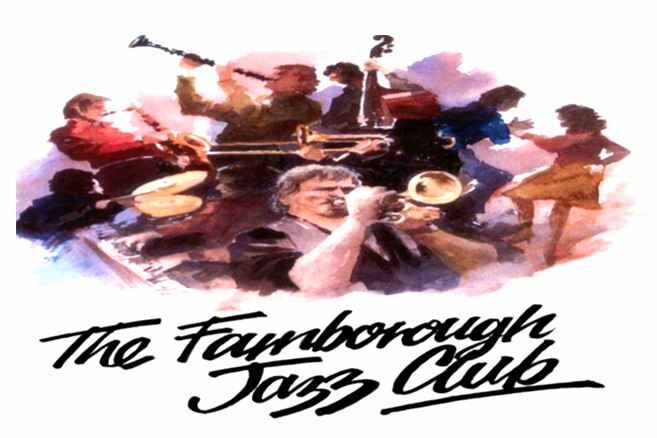 Vintage Jazz Band was one of our first bands and was still with us up until 11th May 2012. When the pub was sold, the next owners razed the club house to the ground. A friend came by and saw the remains of the club and said to Keith, you must have had a good band last night they brought the house down. We moved the jazz to Keith’s football club and although we worried we would lose the great atmosphere of Badgers, we needn’t have worried, because everyone stayed with us and, mainly due to our ‘mafia table’, our atmosphere too. Having retired, Keith now enjoys life as a watercolour artist, painting famous Jazz musicians, landscapes, seascapes and other subjects. He has had many exhibitions, receiving several commissions. (Please email us for details of future exhibitions & to be notified of his oncoming website). Such talent, I could spit! ha ha.